This blog describes situations when things that should just work cost me a lot of trouble. I post it all here in a hope that others learn from my stories and deal more efficiently with similar issues. Today is 9/27/2008. It has been 4 months since I canceled my service and a month since my most recent conversation with Comcast Customer Support that promised: "We were able make sure your account appears as cancelled as of May 26th" and "Your refund check will be 142.29, you should be expecting that within the next 4 to 6 weeks". 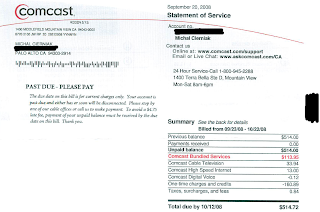 And I still received a new bill from Comcast. By now they claim that I owe them over $500 even though in fact they owe me money. Here's a copy of the header of that latest bill. Love that you are exposing corrupt and deceptive business practices!! One day, corporate fraud will be a thing of the past... because we used the internet to make it "not profitable." Using twitter to solve my problem?